Based on the successful approach of the Practice Makes Perfect series, German Pronouns and Prepositions offers a clear and engaging presentation of all aspects of pronoun and preposition usage, combined with extensive practice, for beginning and intermediate language learners. This new edition features a new review chapter that allows learners to pull together the grammar skills they've acquired. 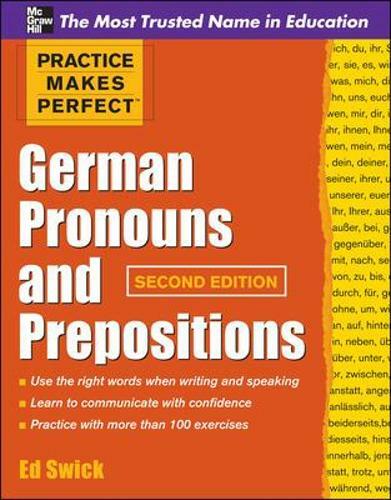 This new edition in the successful Practice Makes Perfect series, Practice Makes Perfect: German Pronouns and Prepositions offers a detailed examination of these two essential aspects of grammar, which language learners need to master to communicate with confidence. Learners of a foreign language often have difficulty with these areas because the usage of pronouns or prepositions rarely translates directly from English to the new language. Thus, language learners need much more practice in the areas of pronoun and preposition usage than is provided in general grammar books. This book provides clear explanations of the usage of pronouns and prepositions, followed by practical examples illustrating and clarifying each point. Extensive and varied exercises provide ample opportunity to practice. Answers to all questions are provided at the back of the book, providing immediate feedback. The new edition features a brand-new review chapter that allows learners to pull together the grammar skills they've acquired throughout the book. New edition features a brand-new review chapterDetails all aspects of pronoun and preposition usageClarifies the subtleties of pronouns and prepositions that often escape language learnersHighly varied and extensive exercises for practicePractical and high-frequency vocabulary used throughoutAnswer key provided for reference and quick feedbackCombines the best elements of instruction and practice so readers find all they need in one book.